This year too Roweb is offering a summer internship program meant to support students from all years of study at the Faculty of Mathematics and Computer Science as well as the Faculty of Electronics, Communications and Computers. At the same time, we wish to get to know the most talented students and discover those that will join our team at the end of the internship. In the past few years our team as grown at an accelerated rate and, to be able to sustain this pace, it’s important to us to invest in the professional growth of young developers. We do this by offering and hosting training sessions and annual internship programs. Last year 60 students enrolled in our .NET, PHP and Android programs. Out of these, four very talented young developers stayed with us as permanent employees and are now part of our mobile team. In fact, many of our colleagues joined us while they were still undergraduates and are still part of our team, some for more than 10 years. This internship can be the beginning of a successful career in software development, considering that 9 out of 10 Roweb employees started working here while still in college. 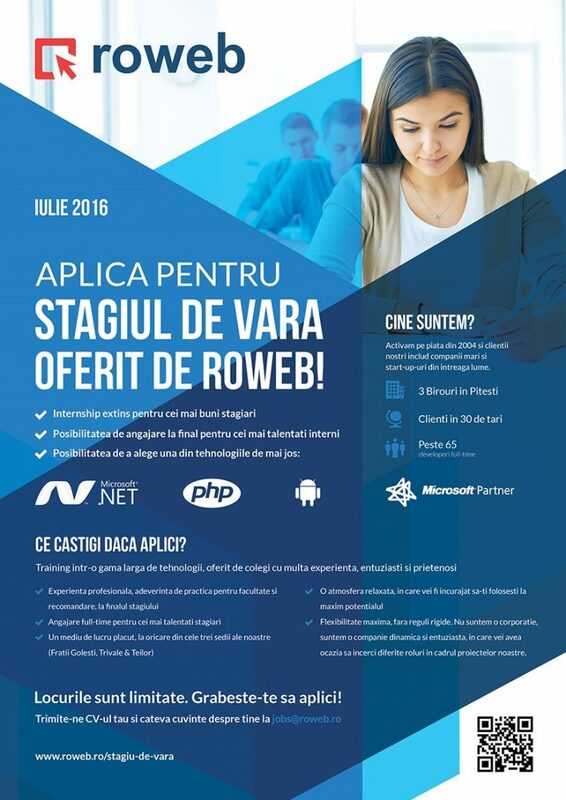 This year we’ll be offering the same 3 options of study programs as last year – .NET, PHP and Android development – and at the end of the program, the most talented interns will be offered full-time jobs at Roweb. The internship will last 4 weeks, throughout July. During the internship, the students will be integrated in our friendly and relaxed work environment and they’ll be encouraged, challenged and supported to use their full potential. They will work together with our senior developers, very friendly and glad to share their experience and knowledge. Students who are passionate about programming, enthusiastic, eager to learn new things and put them into practice, are invited to send their CV and a few words about them, about their knowledge level and / or experience as well as what motivates them to choose one of the 3 programs, at jobs@roweb.ro or on www.roweb.ro/stagiu-de-vara.